ither you give away Fresh Motichoor Ladoos, Mawa Pedas, Jalebi or Mix mithai of your choice on a Birth Announcement, birthday or during a wedding celebration - We have it all for you. Call for bulk orders for us to make it fresh for you and indicate your preference of your choice. All boxes are professionally packed and shrink wrapped before shipping. We can even add your announcement right to the Gift box. 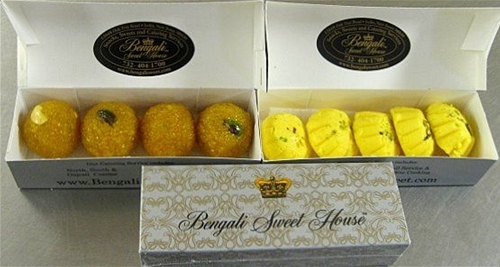 Always Fresh, Never Frozen Indian Sweets made in the traditional way in USA and shipped directly from our Kitchen. A great give away to celebrate, Birth Announcement, any happy occasion or just to show your appreciation.